EHA » Guess who is delivering your next Amazon order? Guess who is delivering your next Amazon order? 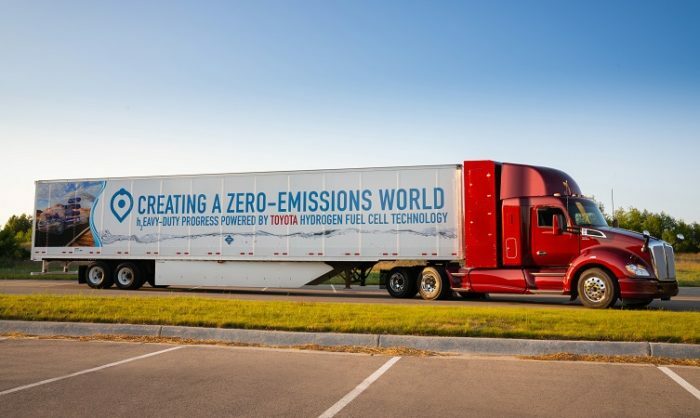 Toyota is featuring its venturing into hydrogen powered trucks this summer: on July 3o it presented its new Beta vehicle at the Center for Automotive Research in Michigan. The Alpha truck trilalled in the Port of Long Beach had a 36.3-tonne gross combined weight capacity and a driving range of more than 200 miles on a hydrogen fill-up. Two Mirai fuel cell stacks and a 12kW/h battery supported an output of more than 670bhp and 1,796Nm of torque. The new Project Portal Beta maintains these power and torque figures but with an extended range and improvements in other key performance metrics. The Beta truck project is a continuation of the Toyota Environmental Challenge 2050 effort to eliminate CO2 emissions at its Port of Long Beach logistics facility. Previously, Toyota announced the construction of the Tri-Gen operation, which will be the world’s first megawatt-capacity fuel cell power generation plant with hydrogen refuelling. The plant will use agricultural waste to produce water and generate electricity and hydrogen to support the operations of Toyota Logistics Services at the Port of Long Beach. Last miles can also be delivered in the new Daimler Sprinter F-CELL, says Volker Mornhinweg, Head of Mercedes-Benz Vans: “We will offer every commercial range with an electric drive – starting this year with the eVito and in 2019 with the eSprinter. With these, we will already cover many, but not all, use cases with a zero-local-emissions powertrain. For this reason, we are enhancing our [email protected] strategy with fuel-cell drive, which offers substantial medium-term opportunities, especially in long-distance operation – regardless of whether a fuel-cell vehicle is used as a motorhome or in other commercial applications” . The potential of this technology is undisputed. That applies above all to comparatively large vans with a need for long range and short refuelling times. Our analyses demonstrate that the fuel cell can represent a sensible expansion of the powertrain line-up in a number of different applications in both the commercial and private arenas. The Concept Sprinter F-CELL provides an insight today into the possibilities of the future”.